Demetricator. The Facebook interface is filled with numbers. These numbers, or metrics, measure and present our social value and activity, enumerating friends, likes, comments, and more. 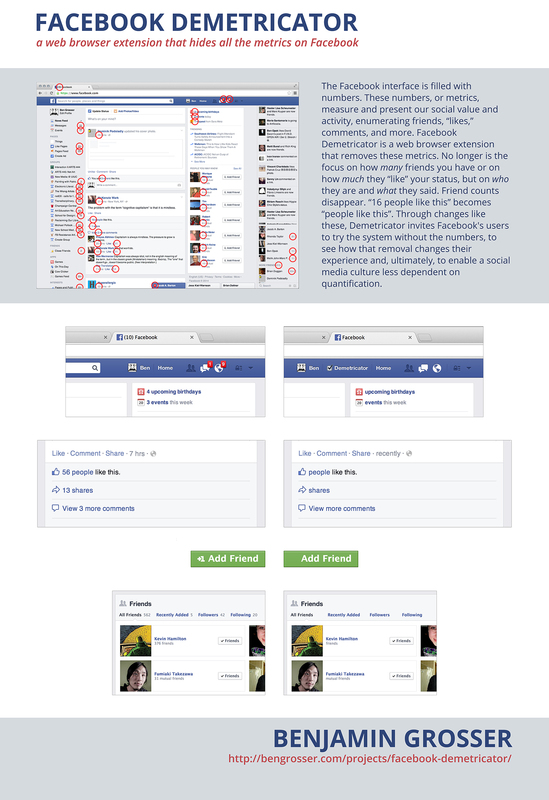 Facebook Demetricator is a web browser addon that hides these metrics. No longer is the focus on how many friends you have or on how much they like your status, but on who they are and what they said. Friend counts disappear. ’16 people like this’ becomes ‘people like this’. Through changes like these, Demetricator invites Facebook’s users to try the system without the numbers, to see how their experience is changed by their absence. With this work I aim to disrupt the prescribed sociality these metrics produce, enabling a network society that isn’t dependent on quantification. Benjamin Grosser focuses on the cultural, social, and political effects of software. What does it mean for human creativity when a computational system can paint its own artworks? How is an interface that foregrounds our friend count changing our conceptions of friendship? Why do we become emotionally attached to software systems and what does this attachment enable for those who made them? To examine questions like these, he constructs interactive experiences, machines, and systems that make the familiar unfamiliar, revealing the ways that software prescribes our behavior and thus, how it changes who we are. Grosser is an Assistant Professor at the School of Art + Design at the University of Illinois at Urbana-Champaign (UIUC), and a Faculty Affiliate at the National Center for Supercomputing Applications (NCSA) building an initiative in critical technology studies. His research into artificially-intelligent creative systems is funded by DARPA’s Communicating with Computers program. Prior to Grosser’s current appointments, he earned an MFA in new media and an MM in music composition (both from Illinois), and was the Director of the Imaging Technology Group at the Beckman Institute for Advanced Science and Technology. Grosser’s works have been exhibited at major international venues, exhibitions, and festivals, including Eyebeam in New York, The White Building in London, Telecom Italia Future Centre in Venice (Italy), FILE in São Paulo (Brazil), Media Art Futures Festival in Murcia (Spain), Athens Digital Arts Festival (Greece), Piksel in Bergen (Norway), WRO Media Art Biennale in Wroclaw (Poland), The Public Private at the New School in New York, Science Gallery in Dublin (Ireland), kim? Contemporary Art Centre in Riga (Lativa), and Museum Ludwig in Cologne (Germany). His work is currently on view as part of The Wrong — New Digital Art Biennale and his solo exhibition titled Systems Under Liberty at Galerie Charlot in Paris.